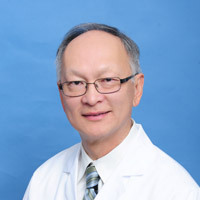 Dr. Eddie Hong-Lung Hu is the clinic director for the Alhambra hematology-oncology office. He is board certified in internal medicine, hematology and medical oncology, and offers patients access to on-site clinical trials and research. Dr. Hu is fluent in Mandarin and Cantonese. Having practiced for decades in the San Gabriel Valley, he is well versed in taking care of Asian patients, and is sensitive to their cultural and physical needs. While his research background is in lymphoma and hematologic malignancies, he now practices general oncology, and treats patients with all types of cancer. In addition to his clinical work, he is also a clinical professor of medicine at the David Geffen School of Medicine at UCLA. Dr. Hu earned his medical degree from University of Chicago Pritzker School of Medicine. He then completed his internal medicine internship and residency at the University of California, San Diego, and his oncology/hematology fellowship at Stanford University, where he also completed his undergraduate studies. Dr. Hu was raised in Hong Kong and moved to California at 18 to attend college. He lives in Pasadena, and when he’s not working, enjoys Tai Chi, reading, and watching and participating in sports. He is a member of the American Society of Hematology, the American Society of Clinical Oncology and the American College of Physicians. Learn more about genitourinary and kidney disorders in children, including Anatomy of the Urinary System, Overview of Kidney Disorders. The BRCA genes are the most common cause of gene-related breast and ovarian cancers. In the U.S., 1 in 20 to 1 in 10 of all breast cancers and 1 in 10 to 3 in 20 of all ovarian cancers in white women are related to BRCA mutations. This blood test checks for mutations. Mesothelioma is a rare kind of cancer. It starts in the mesothelium. This is a thin lining that surrounds organs in certain parts of the body. Mutations (or changes in the DNA) have occurred over time in different parts of the world. Anyone can carry any type of recessive gene. However, certain ethnic groups are more likely to carry certain recessive genes, because of where the mutation originated. Overview of autosomal recessive inheritance, including cystic fibrosis, sickle cell anemia, and Tay Sachs disease. Cancer of unknown primary (CUP) is cancer that starts in an unknown area and has already spread by the time it's diagnosed.